Lead Sinker Notice: The sale of this item may be restricted from Maine, New Hampshire, Vermont, or New York. it will be removed from your order if shipping to a restricted location. Tungsten Drop Shot Round Sinker, 1/8oz. to 1/2oz. Drop Shot Round Sinker, Size 1/8oz. to 1/2oz. Drop Shot Pencil Sinker, 1/4oz. to 3/8oz. Worm Weight / Sinker (lead), 1/16oz. to 1/2oz. 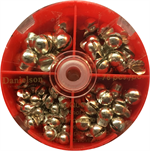 Quick-Change Walking Sinkers Size 1/4oz. to 1oz.